When I was at Lafayette Park (across from the White House) recently checking the logistics/arrangements for IBW's June 17th Day of Direct Action to pressure President Obama to end the War on Drugs and invest in inner-city Black communities, I confess to having been filled with pride thinking about the reality of a Black Family occupying the White House! But, I pinched myself to get past the fact that Barack Obama is the first African American President of the USA. I had to quickly remind myself that electoral politics is about who gets what, how much and when. At least that's what our beloved Dr. Ronald Walters spent much of his life striving to teach us. It doesn't matter the color, race, ethnicity or even political persuasion of the resident in the White House, Presidents should respond to the crises of people/groups because they are part of the body politic of this nation. If a constituency/group is a key part of the President's political support base, there is an even more compelling reason to attend to their needs. Unfortunately, as it relates to Blacks, these basic expectations of electoral politics seem not to apply. For decades Presidents have failed to respond to the crises in Black America in proportion to our needs or political support - particularly the Democratic Party. Thus far, this is certainly the case with President Obama. Despite the "State of Emergency" in America's "dark ghettos," he refuses to directly respond to the urgent needs of Blacks who marched on ballot boxes in record numbers to ensure his election and re-election. Instead of policies and programs specifically designed/targeted to ameliorating and ultimately transforming the conditions in distressed urban communities, Black America is treated to symbolism, access and lectures about personal responsibility. Many Blacks seem to be content with President Obama's approach, choosing to give him a pass because he is a "brother." On the other hand, there are growing numbers of Blacks from all walks of life who are simply getting tired, frustrated and angry at the President's reluctance to openly address what can only be considered a moral and political crisis in terms of depression levels of joblessness, horrific gun violence, fratricide and mass incarceration in urban inner-city Black communities. For some, Obama is like a Black Nero fiddling while Black communities are imploding! No doubt deep down inside this President may want to identify with the needs of Black people, but apparently he is afraid of a "White backlash" if he shows his true colors. 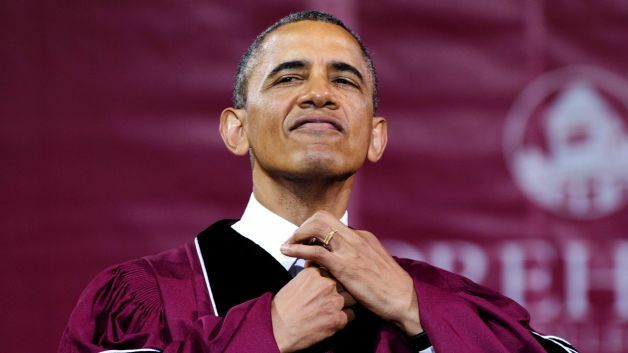 So, in lieu of programs and policies directed/targeted to relieve distressed Black communities, we get symbolism - the President and First Lady delivering commencement addresses at historically Black colleges and universities or visiting inner-city schools. Certainly there is no harm in symbolism except when it's a substitute for the kind of substantive policies which would alleviate the pain and suffering of people who not only need a kind word but jobs, economic development and relief from violence and fratricide. The same applies for "access" to the White House. Never in my life have I witnessed Blacks having so much access to the White House via conference calls, Black talk radio interviews, briefings and celebratory gatherings/parties (folks brag about jamming at the White House with the First Lady and the Prez). And, of course, the Congressional Black Caucus, National Urban League, NAACP and National Action Network have been favored with appearances at their conventions by the most powerful leader in the world - who happens to be a Black man! The problem is that the President seldom if ever speaks directly to the most urgent concerns of Black America at these auspicious gatherings - the State of Emergency in America's dark ghettos. Can you imagine President Obama speaking to a Latino convention and not addressing the issue of immigration policy reform or talking to a lesbian and gay organization without discussing marriage equality and LBGT rights? He wouldn't dare insult these groups by not directly addressing their priority agendas. Finally, and perhaps the most egregious act of all is President Obama's persistent lecturing to Black audiences/Black people about personal responsibility. The most recent instance was his pep talk to the highly accomplished graduates of Morehouse College - who hardly needed a lecture on altering their behavior to be more responsible young men. President Obama has also used Father's Day to become "daddy-in-chief," exhorting us to just behave better, and more responsibly. There is nothing inherently wrong with encouraging people to do better but it would have much more credibility and impact if the lecture was accompanied by a call on the nation and its political and economic institutions to invest in revitalizing communities ravished by disinvestment, deindustrialization, the war on drugs and mass incarceration. Otherwise, these patronizing lectures are an insult to Black people! As we gear up for the June 17th Day of Direct Action, what President Obama can do for Black America is not radical and should not be racially divisive. Instead of another demeaning Father's Day lecture, he should declare joblessness in the inner-cities a national crisis and propose a massive jobs/economic investment program with a priority on training and hiring formerly incarcerated persons. Though they are not likely to join our Drum Majors for Justice at the gates of the White House, virtually every civil rights leader from Rev. Al Sharpton, National Action Network to Marc Morial, National Urban League, Melanie Campbell, National Coalition for Black Civic Participation to Benjamin Jealous, NAACP and the Congressional Black Caucus agree that something similar to a targeted jobs/economic program is a top priority to revitalize distressed Black communities. I think they would also agree that what Black America does not need is another lecture!